Megatrends such as demographic change, globalisation and digitalisation influence all societal spheres, be it the economy, labour market, education or culture. Consequently, it is important to estimate how strong these effects are and collect qualitative information on the nature of their impact. Whilst the effects of demographic change and globalisation have already been broadly discussed, changes resulting from digital transformation have scarcely been reflected upon systematically, especially in the case of labour markets. 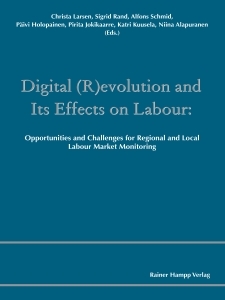 Against this background, the European Network on Regional Labour Market Monitoring (EN RLMM) has chosen the digital transformation of societies and economies and its effects on labour as its guiding theme for 2016. Together with the members of the network, we seek to present the state of the current knowledge, specify first action requests and options and capture the relevance of digital transformation for regional and local labour market monitoring. The current anthology of the EN RLMM constitutes the first building block in this process: it brings together contributions discussing the effects of digital transformation on specific sectors and occupations as well as labour market target groups. Furthermore, it contains regional good practice examples describing and analysing the digital transformations of regions.